FilterBank, Software Filter from McDSP. November 6-9 McDSP offers FilterBank Native for $149 ($50 savings) and FilterBank HD for $199 ($100 savings). FilterBank is an equalizer plug-in designed to emulate the sounds of vintage and modern equalizers and filters. FilterBank contains 3 plug-ins: the E606 equalizer, the P606 parametric equalizer, and the F202 filter set. 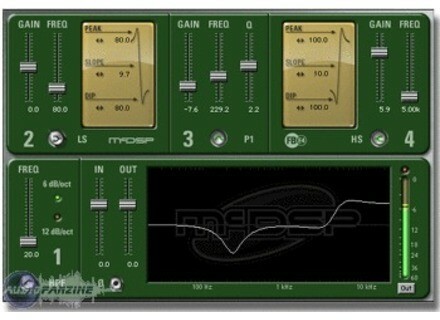 Check out secure.mcdsp.com/individual_plug-ins for more details. NI Komplete Audio 6 & Guitar Rig 5 Pro Bundle Native Instruments launched a special time-limited offer on Komplete Audio 6. IK iGrand Piano for iPhone & iPod Touch IK Multimedia announces the release of iGrand Piano for iPhone and iPod touch, an app, offering 17 stereo pianos. Nektar Panorama Rack Extension Control Nektar announced the release of Panorama P4 support for 14 new Reason Rack Extensions, taking the total of supported RE's up to 38 in total.